Size (inches): 12.99" X 7.87" X 3.54"
Recreate the action from the hit X2 movie with this Deluxe Wolverine Figure, or set him out on your shelf for display. Kids, collectors and movie buffs are sure to love this articulated, poseable action figure. Modeled after the mysterious X-MEN character from the film, Wolverine features a stunning attention to detail and amazingly realistic sculpt. Measures approximately 13 inches tall. 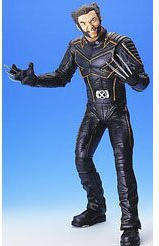 More Photographs - Wolverine - 12"
End of More Photographs - Wolverine - 12"